Product prices and availability are accurate as of 2019-04-20 17:48:11 BST and are subject to change. Any price and availability information displayed on http://www.amazon.co.uk/ at the time of purchase will apply to the purchase of this product. 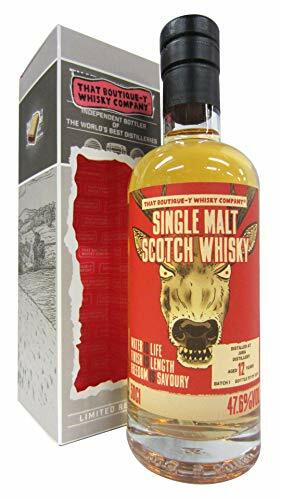 "50cl / 47.6% - That Boutique-y Whisky Company has finally bottled its first batch of Jura single malt. This ace 12 year old expression from the eponymous island features a label that reference's George Orwell's 1984, which the legendary author wrote while on Jura. It's also got a reference to Jura's overwhelming deer popular. Four legs good, two... Wait, that's the other one. Sorry. Never mind. Carry on. Batch 1 is a release of 225 bottles. ?That Boutique-y Whisky Company? bottles single malts, single grains and bourbons from a variety of renowned distilleries as well as producing award-winning blended malts and blends. These whiskies are adorned with cultish graphic novel-style labels. "